ROYAL CANIN Sphynx Cat Adult Dry Cat Food is both scrummy and nutritious! ROYAL CANIN Sphynx Adult food is formulated with the specific needs of this interesting breed in mind. Suitable for Sphynx cats over 12 month of age, ROYAL CANIN Sphynx Adult will provide your cat with all the nutritional support it needs. To compensate for the absence of hair, the Sphynx has a very active metabolism that helps it to regulate its body temperature. 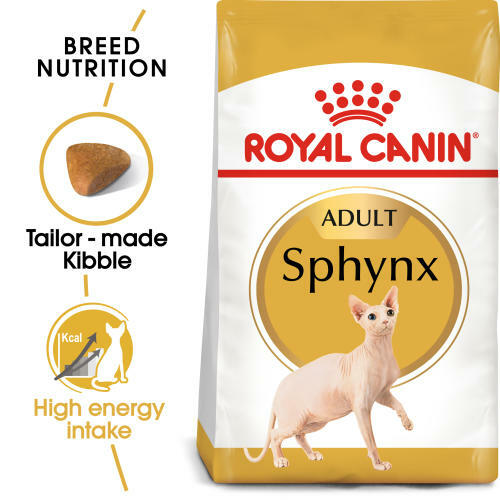 ROYAL CANIN Sphynx Adult food is a high-calorie formula that contains an increased level of fat (23%) in order to meet the heightened energy needs of this particular breed. Dietary management plays an essential role in maintaining a healthy heart. That’s why ROYAL CANIN Sphynx Adult contains taurine, EPA and DHA (omega-3 fatty acids) to help maintain your cat’s healthy cardiac function. Special Sphynx Jaw - This specially designed thick triangular-shaped kibble, adapted to the Sphynx cat’s jaw, encourages chewing to help support oral hygiene. High energy intake - A high calorie formula with a high level of fat (23%) to meet the greater energy needs of this hairless cat. Healthy skin support - An exclusive complex of nutrients helps support the skin’s “barrier” role. Enriched with Omega 3 and Omega 6 fatty acids for their support in skin health. Cardiac health - Taurine, EPA and DHA to help maintain healthy cardiac function. Additives: Vitamin A: 32000 IU, Vitamin D3: 900 IU, E1 (Iron): 36 mg, E2 (Iodine): 3,6 mg, E4 (Copper): 11 mg, E5 (Manganese): 47 mg, E6 (Zinc): 140 mg, E8 (Selenium): 0,09 mg, L-carnitine: 50 mg, Taurine: 2,57 g - Technological additives: Clinoptilolite of sedimentary origin: 10 g - Preservatives - Antioxidants. Composition: Dehydrated poultry protein, animal fats, rice, vegetable protein isolate*, maize gluten, vegetable fibres, maize, dehydrated pork protein*, hydrolysed animal proteins, wheat, beet pulp, yeasts and parts thereof, fish oil, minerals, dried tomato pulp (source of lycopene), soya oil, fructo-oligo-saccharides, hydrolysed yeast (source of manno-oligo-saccharides), borage oil, marigold extract (source of lutein). *L.I.P. : protein selected for its very high digestibility. Crude ash: 7.3%. Crude fibre: 5%. Crude oil fats: 23%. Moisture: 0%. Protein: 33%.